Many towns and communities throughout Colorado claim to have scenic roads to drive for viewing autumn foliage. Are some better than others? You bet they are! This guide will describe the most spectacular autumn drives and locations in all of Colorado. Actually, they're the best in all of the Rockies. 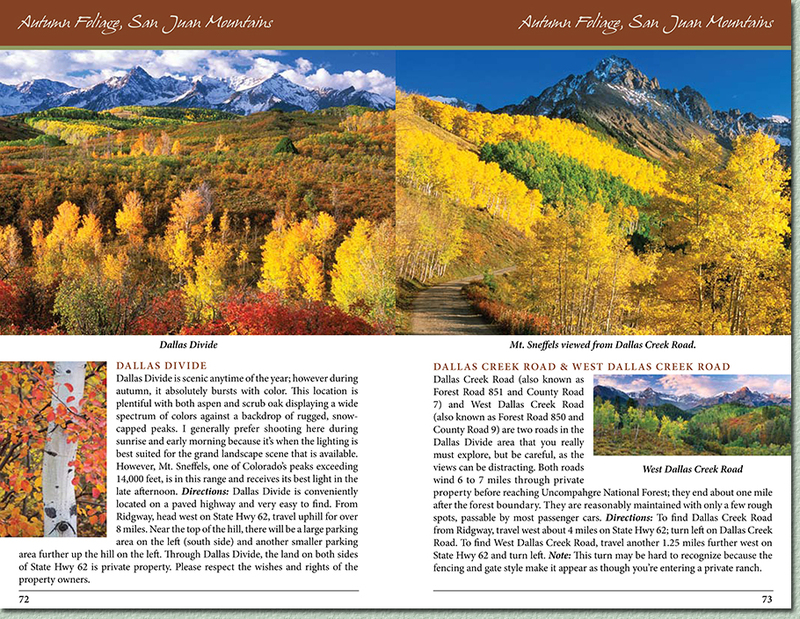 Below is pages 72 & 73 from the Colorado Autumn Colors section of the book. The following is a sample paragraph from the Colorado Autumn Foliage section of the book. Autumn Foliage: The peak of Colorado's autumn foliage display varies with elevation and location. Higher elevations normally turn before lower elevations and different locations may peak at varying times. For most of Colorado, peak season usually occurs during the last two weeks of September or the first week of October. Usually the central mountain region of the state changes one week to ten days earlier than the southern mountains, including the San Juans. Aspen leaves change to yellow, gold or sometimes fiery orange and provide the majority of color during autumn. When scrub oaks are present, they account for the remainder of color, adding various hues of orange and red to the landscape. Many mountain towns claim to have wonderful scenic drives to view fall colors, however, the locations described on the following pages are some of the premier hot spots for exceptional autumn shooting. Aspen forests are quite fickle, yielding peak colors for only a short duration and not necessarily at the same time as surrounding forests. If you do not find adequate color at one place, travel a few miles and you may discover a forest displaying peak color. If you are planning a driving trip over several days, it may be convenient to visit the locations as they're sequenced in this book.